Many folks would like to see us back on the Moon and developing its resources. Chang’e 3's landing cushion technology employs superplastic materials. When Apollo 11 landed on the Moon there was a need to provide a way to cushion the landing and a crushable aluminum-honeycomb cartridge was used. Now I see the term 'superplastic' used in relation to the cushion technology for Chang'e 3 lander. Wasn't familiar with the term and still a bit confused as the immediate information seems to be about being able to form materials. Superplastic, sounds so simple, just maybe some stretchy thing, but what really? Stretch, crush, either way, a lot of testing. Landing your egg on the Moon without breaking the shell. What would you design? In its ambitious landing sequence, the Chang’e 3 lander is dropped from an altitude of 4 meters which required a cushioning landing system on the lander to create a fairly soft landing. The system also has to support the Rover release that is performed after landing. A “cantilever-type” design has been selected for Chang’e 3. The landing system utilizes four primary landing legs that are equipped with footpads to avoid sinking into the surface. The Chinese used previous lander designs and knowledge on the properties of the lunar dust to develop a landing system that minimizes mass while maximizing stability. The primary landing struts facilitate bumpers with interior buffer elements to provide shock-absorbing capabilities. The legs are installed at a 30° angle to the lander structure. Multi-functional and single-functional secondary struts are attached to the landing legs to provide additional attach points to the lander body. You may not be up to reading 318 pages but a look at the table of contents might be informative. Still not seeing what was done. In materials science, superplasticity is a state in which solid crystalline material is deformed well beyond its usual breaking point, usually over about 200% during tensile deformation. Such a state is usually achieved at high homologous temperature, typically half the absolute melting point. Examples of superplastic materials are some fine-grained metals and ceramics. Other non-crystalline materials (amorphous) such as silica glass ("molten glass") and polymers also deform similarly, but are not called superplastic, because they are not crystalline; rather, their deformation is often described as Newtonian flow. Superplastically deformed material gets thinner in a very uniform manner, rather than forming a "neck" (a local narrowing) that leads to fracture. Also, the formation of microvoids, which is another cause of early fracture, is inhibited. In metals and ceramics, requirements for it being superplastic include a fine grain size (less than approximately 20 micrometres) and a fine dispersion of thermally stable particles, which act to pin the grain boundaries and maintain the fine grain structure at the high temperatures and Existence of Two Phases required for superplastic deformation. Those materials that meet these parameters must still have a strain rate sensitivity (a measurement of the way the stress on a material reacts to changes in strain rate) of >0.3 to be considered superplastic. The mechanisms of superplasticity in metals are still under debate—many believe it relies on atomic diffusion and the sliding of grains past each other. Also, when metals are cycled around their phase transformation, internal stresses are produced and superplastic-like behaviour develops. Recently high-temperature superplastic behaviour has also been observed in iron aluminides with coarse grain structures. It is claimed that this is due to recovery and dynamic recrystallization. ^ G. E. Dieter, Mechanical Metallurgy, Third Edition, McGraw-Hill Inc., 1986, p. 299–301 and 452–453, ISBN 0-07-016893-8. ^ Sharma, Garima; Kishore, R.; Sundararaman, M.; Ramanujan, R.V. (15 March 2006). "Superplastic deformation studies in Fe-28Al-3Cr intermetallic alloy". Materials Science and Engineering: A 419 (1–2): 144–147. doi:10.1016/j.msea.2005.12.015. Could something like this be used? properties. The finding was published in a recent issue of journal Science. through the appropriate choice of its composition by controlling elastic moduli. scientific and application perspective for the material. Well I didn't see a definitive answer to exactly what was used to cushion the Chang'e 3 lander. Maybe you saw something I missed. Thanks for looking up with me. As promised, Lunar Reconnaissance Orbiter's sharp eyes spotted the Chang'e 3 lander and Yutu rover on the lunar surface on December 25. The hardware shows up as a few bright pixels throwing long, dark shadows, clearly visible in a before-and-after comparison. The lander is the bigger blob, the rover a much smaller one. There was a lot of action on Chang'e 3 over the weekend! The first thing I want to share with you is this cool little video of the rover rolling, evidently shot on the Moon. I took it from this news report on Youtube. It was a television camera recording of a video monitor, so the color is all washed out, but you are looking at video of a rover making tracks on the dusty surface of another world. Tremendous. And the adventure begins. Have a happy new year. The Active Particle-induced X-ray Spectrometer (APXS), carried by the Yutu rover of the Chang’e-3 satellite, got its first X-ray fluorescence spectrum of lunar regolith around the landing site on December 25, 2013. An initial analysis indicates that eight major rock-forming elements (Mg, Al, Si, K, Ca, Ti, Cr and Fe) and at least 3 minor elements (Sr, Y and Zr) of the Moon can be identified in this spectrum. 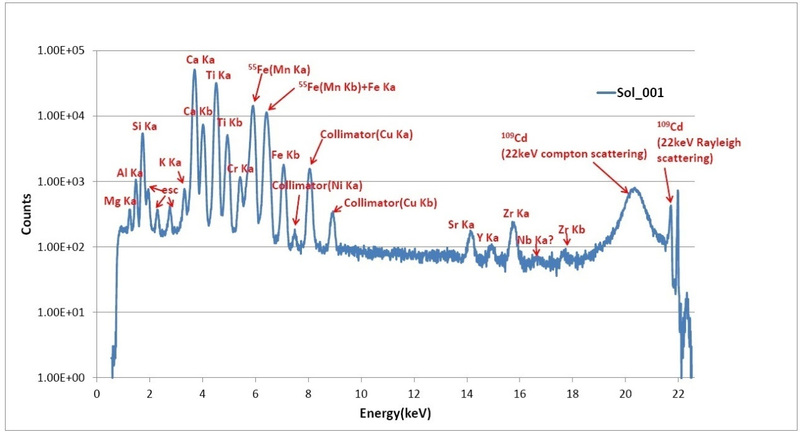 Besides, the energy resolution of APXS is estimated to be about 135 @ 5.9 keV, which demonstrates that it is currently one of the best X-ray spectrometers for planetary exploration in the world. APXS was firstly powered on December 23, and an in-flight calibration of a standard basalt rock sample mounted on the rover was accomplished in five minutes, which proved its stable performance on the Moon. Two days later, APXS was successfully deployed to about two to three centimeters above the lunar regolith surface by the robotic arm of Yutu and started the detection mode. APXS was not only an X-ray spectrometer, but also served as a distance sensor during the deployment by making use of how X-ray count rate varied with distance. The Institute of High Energy Physics (IHEP) developed APXS in collaboration with the Purple Mountain Observatory (PMO), CAS. Prior to the APXS on Chang’e-3, two X-ray spectrometers onboard Chang’e-1 and Chang’e-2 developed by IHEP scientists were launched respectively in October 2007 and October 2010. Guang Pu Xue Yu Guang Pu Fen Xi. 2013 May;33(5):1360-3. [Near infrared distance sensing method for Chang'e-3 alpha particle X-ray spectrometer]. Liang XH, Wu MY, Wang HY, Peng WX, Zhang CM, Cui XZ, Wang JZ, Zhang JY, Yang JW, Fan RR, Gao M, Liu YQ, Zhang F, Dong YF, Guo DY. Alpha particle X-ray spectrometer (APXS) is one of the payloads of Chang'E-3 lunar rover, the scientific objective of which is in-situ observation and off-line analysis of lunar regolith and rock. Distance measurement is one of the important functions for APXS to perform effective detection on the moon. The present paper will first give a brief introduction to APXS, and then analyze the specific requirements and constraints to realize distance measurement, at last present a new near infrared distance sensing algorithm by using the inflection point of response curve. The theoretical analysis and the experiment results verify the feasibility of this algorithm. Although the theoretical analysis shows that this method is not sensitive to the operating temperature and reflectance of the lunar surface, the solar infrared radiant intensity may make photosensor saturation. The solutions are reducing the gain of device and avoiding direct exposure to sun light. Guang Pu Xue Yu Guang Pu Fen Xi. 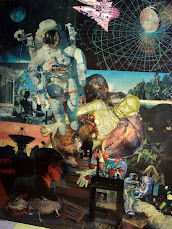 2012 Jul;32(7):1965-8. [Temperature effect correction for Chang'E-3 alpha particle X-ray spectrometer]. Wu MY, Wang HY, Peng WX, Zhang CM, Zhang JY, Cui XZ, Liang XH, Wang JZ, Yang JW, Fan RR, Liu YQ, Dong YF, Wu F, Zhao XY. Alpha particle X-ray spectrometer (APXS) is one of the payloads of Chang'E-3 lunar rover of China's Lunar Exploration Project. The present paper introduces briefly the components of APXS, how it works and its working environment on the lunar surface. The environmental temperature effect has been studied with simulations and experiments, and the results show that the temperature of the APXS sensor will be varying during the measuring on the lunar surface. And another experiment reveals that the energy resolution becomes worse if the sensor's temperature is varying. In this paper, a correction method based on Pearson's chi-squared test is presented. The method can improve the energy resolution when the sensor's temperature is varying. We have tested the method with the spectra acquired by APXS in the temperature varying period of Temperature Cycling Test, and the results show that the method is efficient and reliable. APXS was developed by IHEP (Institute of High Energy Physics) of CAS. The objective is to measure the composition and distribution of various elements on the lunar surface by observing the scattered X-rays from the bombardment of alpha particles on rocks. Located on the rover’s robotic arm, APXS is capable of active particle scattering, in-situ determination of lunar surface elements, in-orbit calibration and distance measurement functions. The sensor can re-calibrate itself through the use of standard calibration targets, and the rover's lunar night survival contains a RHU (Radioisotope Heater Unit) for keeping the sensor warm. It has low energy consumption, low mass, high resolution, and high sensitivity semi-conductor sensors are used. Read more about China's Chang'e 3 mission. Chang'e-3 is part of the second phase of China's lunar program, which includes orbiting, landing and returning to the Earth. It follows the success of the Chang'e-1 and Chang'e-2 missions in 2007 and 2010, respectively. Chang'e-3 is China's first lunar rover, and the first spacecraft in 37 years to make a soft landing on the moon, since the Soviet Luna-24 mission in 1976. It is named after Chang'e, the goddess of the moon in Chinese mythology, and is a follow-up to the Chang'e-1 (launch Oct. 24, 2007)and Chang'e-2 (launch Oct. 1, 2010) lunar orbiters. According to CNSA (China National Space Administration), the landing site of Chang'e-3 will be Sinus Iridium near the Mare Imbrium. China's Jade Rabbit rover vehicle sent back photos from the moon Sunday after the first lunar soft landing in nearly four decades marked a huge advance in the country's ambitious space programme. The Yutu, or Jade Rabbit, was deployed at 4:35 am (2035 GMT Saturday), several hours after the Chang'e-3 probe landed on the moon, said the official news agency Xinhua. The rover and lander began taking photos of each other late Sunday, including one that showed the bright red and yellow stars of the Chinese flag on the Jade Rabbit as it stands on the moon's surface. Xinhua said the photographing began at about 11:42 pm after the rover moved to a spot a few metres away from the lander. The colour images were transmitted live to the Beijing Aerospace Control Center, where Chinese President Xi Jinping and Premier Li Keqiang watched the broadcast. China is the third country to complete a lunar rover mission after the United States and the former Soviet Union -- a decade after it first sent an astronaut into space. Beijing plans to establish a permanent space station by 2020 and eventually send a human to the moon. It was nice to see the local TV News mentioning the 45th Anniversary of the Earthrise photo and the Apollo 8 flight around the Moon with the reading from the book of Genesis. Hope you can enjoy the visualization of the taking of the photos of Earth by the Apollo 8 astronauts. Using photo mosaics and elevation data from Lunar Reconnaissance Orbiter (LRO), this video commemorates the 45th anniversary of Apollo 8's historic flight by recreating the moment when the crew first saw and photographed the Earth rising from behind the Moon. Narrator Andrew Chaikin, author of A Man on the Moon, sets the scene for a three-minute visualization of the view from both inside and outside the spacecraft accompanied by the onboard audio of the astronauts. The visualization draws on numerous historical sources, including the actual cloud pattern on Earth from the ESSA-7 satellite and dozens of photographs taken by Apollo 8, and it reveals new, historically significant information about the Earthrise photographs. It has not been widely known, for example, that the spacecraft was rolling when the photos were taken, and that it was this roll that brought the Earth into view. The visualization establishes the precise timing of the roll and, for the first time ever, identifies which window each photograph was taken from. The key to the new work is a set of vertical stereo photographs taken by a camera mounted in the Command Module's rendezvous window and pointing straight down onto the lunar surface. It automatically photographed the surface every 20 seconds. By registering each photograph to a model of the terrain based on LRO data, the orientation of the spacecraft can be precisely determined. Will be interesting to see China's Chang'e 3 mission UV pictures of Earth. Thanks for looking up with me. I hope mankind will again be able to view Earth from the moon. China’s ambitious lunar space exploration program achieved another stunning success Sunday night, Dec 15, when the countries inaugural Chang’e-3 lunar lander and rover beamed back portraits of one another snapped from the Moon’s surface – that also proudly displayed the brilliant red Chinese national flag shining atop an extraterrestrial body for the very first time in human history. “I announce the complete success of the Chang’e-3 mission,” said Ma Xingrui, chief commander of China’s lunar program, during a live CCTV broadcast as the portraits were shown to a worldwide audience from huge screens mounted at the mission control at the Beijing Aerospace Control Center (BACC) in Beijing. Chinese President Xi Jinping was on hand to personally witness the momentous events in real time. The Blue Marble is a famous photograph of the Earth, taken on December 7, 1972, by the crew of the Apollo 17 spacecraft, at a distance of about 45,000 kilometres (28,000 mi). The name has also been applied by NASA to a 2012 series of image data sets covering the entire globe at relatively high resolution, created by carefully sifting through satellite-captured sequences taken over time, to eliminate as much cloud cover as possible from the collated set of images. With the Chang'e 3 mission duo landing on the Moon at the Bay of Rainbows, maybe a few links about Sinus Iridum are in order..
Let's start with Astro Bob's blog where he has the video clips of the landing sequence to Sinus Iridum. You can settle back with your cup of morning coffee knowing that the Chinese moon lander successfully touched down on the lunar surface this morning at 7:11 a.m. (CST). The lander’s descent camera recorded a safe touchdown in the Bay of Rainbows, a 160-mile-wide (257 km) lava flooded relic crater in the moon’s northern hemisphere. Chang’e 3′s onboard optical and microwave sensors guided the spacecraft during its final few hundred feet to the surface. At about 15 feet (4.5 m), the lander’s thrusters switched off and Chang’e 3 free fell the rest of the way to avoid kicking up too much moon dust. Sky at Night as a nice article about Sinus Iridum. Sinus Iridum, or the Bay of Rainbows, is one of the loveliest features of the Moon: the Bay of Rainbows. It leads off the vast Mare Imbrium and was shown and named by the famous lunar observer Giovanni Riccioli in his map drawn in 1651. In those days, of course, it was generally believed that the dark areas really were seas, and that the Moon could well be a world suited to life. Sinus Iridum is called a bay, but it is really a crater whose seaward wall has been virtually destroyed; only a few very low, disconnected fragments can be traced. Elsewhere the mountainous ‘wall’ is continuous and fairly high, though the outermost edge is disturbed for a short distance by the prominent crater Bianchini. The continuous section is bounded by two capes, Promontorium Heraclides and Promontorium Laplace. 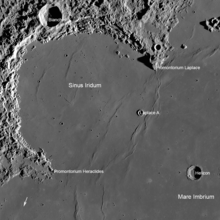 The floor of Iridum slopes downward from the Mare Imbrium, so that at the far side it is about 200ft (61 metres) lower than the level of the Mare. There is nothing quite like this anywhere else on the Moon, but the sequence of events seems to be fairly straightforward. The Mare itself was formed during the lunar epoch named after it – the Imbrium – which ended over three thousand million years ago, so that it post-dates the Great Bombardment. The Iridum impact followed before the great lava-floods, which accounts for the inundation of the seaward wall. And what Wikipedia has to say. Sinus Iridum (Latin for "Bay of Rainbows") is a plain of basaltic lava that forms a northwestern extension to the Mare Imbrium. It is surrounded from the northeast to the southwest by the Montes Jura range. The protruding part of the range at the southwest end is namedPromontorium Heraclides, while that at the northeast end is called Promontorium Laplace. This bay and the surrounding mountains is considered one of the most beautiful features on the Moon, and is a favorite among lunar observers. Sinus Iridum is formed from the remains of a large impact crater, which was subsequently flooded with basaltic lava, inundating the "sea" wall. It does not, itself, contain any notable impact craters, but does include the satellite crater Heraclides E in the south, Laplace A along the eastern edge, and Bianchini G in the north. The surface is level, but is marked by a number of wrinkle ridges. The selenographic coordinates of this bay are 44.1° N, 31.5° W, and the diameter is 236 km. The feature was given the latin name for the Bay of Rainbows by Giovanni Riccioli. On December 14, 2013 the Chinese government successfully executed a soft landing of their rover on Sinus Iridum. The rover, named after the Chinese folklore of the Jade Rabbit (Simp. Chinese: 玉兔), is the first man made object to land on the moon in the 21st Century. The Planetary Society is following Chang'e 3 mission events as they unfold. Several links to Lunar Networks blog links. Sinus Iridum - Next Destination? Remember Japan's orbiter mission, Kaguya, and its high definition videos? 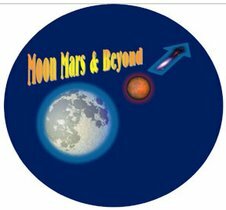 Watch it again at Luna C/I: Moon Colonization and Integration blog by Nick Azer. The circular “Bay”—given its name by Italian astronomer Giovanni Riccioli–is ringed by the Montes Jura, with the cape-like Promontorium Laplace jutting out along the northeast. The Bay has a diameter of ~149 miles, and lays at the northwest corner of the large, western plain Mare Imbrium, about 1,225 miles northwest of the Apollo 11 landing site and 620 miles northwest of the Apollo 15 site. Mare Imbrium’s lava plains are nearly flat, extending into Sinus Iridum (once a crater, with the southeast wall having been eliminated in an Imbrium event). These plains are prime territory for helium-3, and that stretch where there was once the southeastern wall may make for a revealing geological study. Hopefully we will get to see some tracks of the Chang'e 3 mission like we have from the Apollo 15 mission. I am waiting to see if our local cable news has any sound bytes from this historical event. Chang'e 3 (Chinese: 嫦娥三号; pinyin: Cháng'é Sānhào) is a lunar exploration mission operated by the China National Space Administration, incorporating a robotic lander and a rover. Chang'e 3 was launched on the morning of 2 December 2013 local time (17:30 1 December UTC), which is part of the second phase of the Chinese Lunar Exploration Program. It will be China's first lunar rover. The spacecraft is named after Chang'e, the goddess of the Moon in Chinese mythology, and is a follow-up to the Chang'e 1 andChang'e 2 lunar orbiters. The lunar rover is called Yutu, or Jade Rabbit, a name selected in an online poll that comes from a Chinese myth about a white rabbit that lives on the Moon as a companion of the moon goddess Chang'e. It achieved lunar orbit on 6 December 2013 (Beijing time). Topographic data from the Chang'e 1 and 2 orbiters were used to select a landing site for Chang'e 3. The lander descended on Sinus Iridum(Latin for "Bay of Rainbows"), located at 44.1°N 31.5°W on 14 December 2013. Sinus Iridum is a plain formed in a 249 km diameter impact crater, which was subsequently flooded with basaltic lava; it is also a northwestern extension of Mare Imbrium. Please send suggestions for postings directly to Larry. http://www.nasa.gov/centers/ames/multimedia/images/2005/comets1.html Photo No. 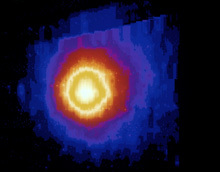 AC86-0107-5 – Halley's Comet, Ultra Violet Hydrogen emission (reddish circular band).